In June 2011, we began talking about Matt’s 10 years of Long Service Leave and what we would like to do when that time came. We tossed around a few ideas – renovate the kitchen, pay a whack off the mortgage, take the kids to Disneyland, go to Bali, sell up and move back to the country etc, etc. However, after a weekend away camping and some talking around the campfire, the idea to take 6 months off and travel around Australia with the kids was born and the talking, planning, talking, dreaming and researching (ok, and maybe a bit of arguing!) began! 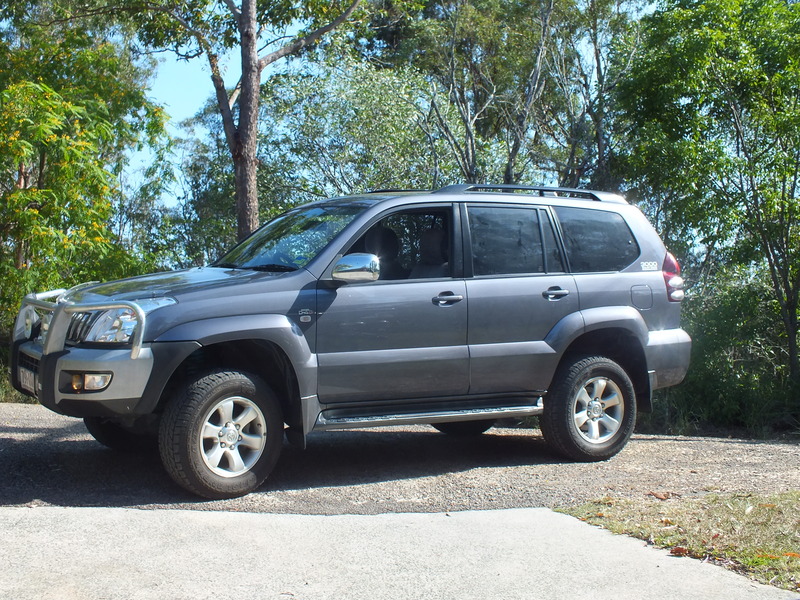 In February 2012 we purchased ‘Peter Prado’ a 2008 model Toyota Landcruiser Prado with just under 100,000km’s on the clock. Many thanks to Mum & Dad for driving all the way to Alpha to collect him and then delivering him to us in Brisbane! In September 2012 we purchased ‘Karen Camper’ a 2003 model Goldstream ‘Goldstar’ Camper Van (there was lot’s of too-ing and fro-ing about the decision of what ‘style of accommodation’ we were going to choose for our trip – we looked at everything from tents, caravans, camper trailers and combi vans – I think we need a whole separate post on why we finally settled on the Goldstar – stay tuned!). 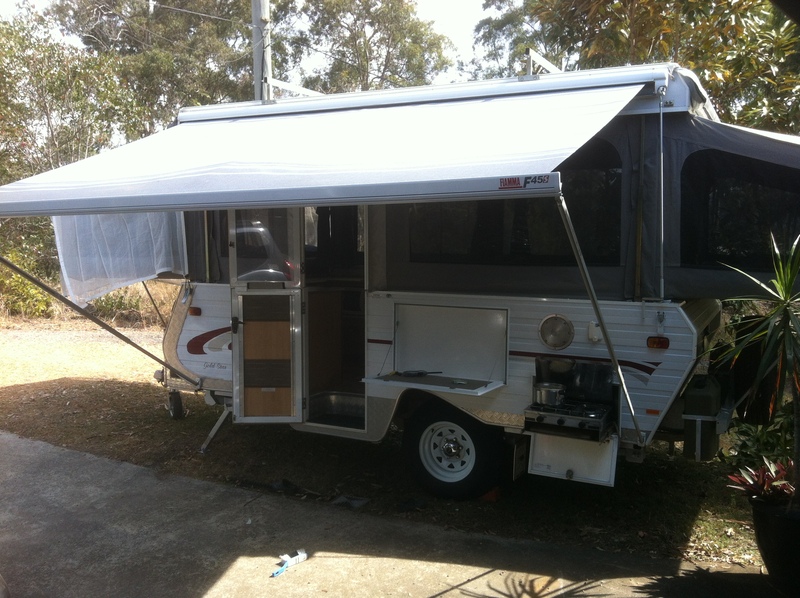 Since then we have managed to fit in one camp a month to some great places like Bribie Island, Somerset Dam, Elanda Point, Flannagan’s Reserve and Sandy Creek. 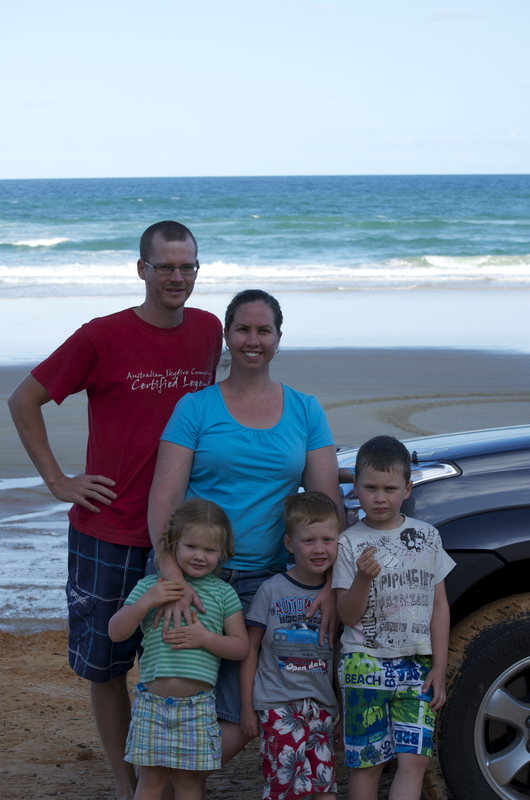 Oh, and we also took the camper all the way home to Far North Queensland and back over Christmas! We are hoping to squeeze a few more camps in before we leave in June. 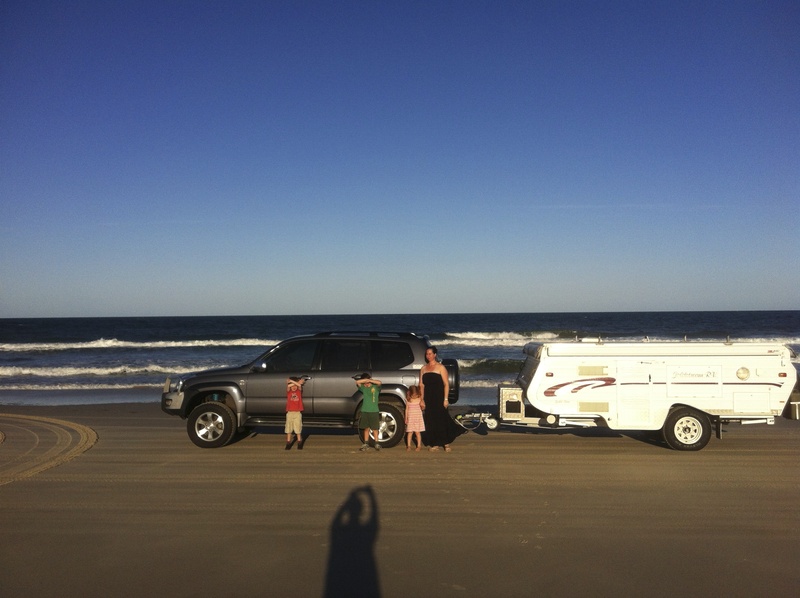 We have done a few modifications to our ‘rig’ – mostly UHF installed, suspension lift, new iPhone compatible stereo unit, new ‘hitchmaster DO35’ hitch for the trailer, dual battery system, Anderson plug, heavy duty power outlet in the rear, roof racks and side awning. Matt will have to do a post for more details on those things! And we have also bought a Waeco fridge/freezer for the back of the car and an air compressor. And in amongst all of this – we have had Jack start Grade 2, Toby finish kindy and start Prep as well as lose his first tooth, and Lexi start Kindy. I had a trip to New Zealand for Nana Bell’s funeral ): Matt is working full time, I’m working part-time and I think that is about it?!?! So that pretty much brings us up to now – 12 weeks until we leave Brisbane on the 1st of June and head off towards Longreach and Winton as our first major port of call. We are hoping to meet some of the family in Winton as a nice kick start to our trip. At the moment we are feeling a little stressed with all we still have to do before then – rent the house, sort out the kids schooling, pack the house and work out where to move it to/store it, keep working to earn as much money as we can, pack camper, sell as much of our unwanted/unnecessary household items as we can to increase our $$$ for the road, get our blog up and running, remember to not yell at children when it is all feeling too stressful, sell our second vehicle as this is our fuel money for the trip, declutter the house, cleaning and tidy up jobs around the house so it is ready to be rented, research places we ‘must’ see …………….. oh the list is endless! But nothing great is easy right??? And we are soooooooo excited at the prospect of seven or so months on the road all together and getting to see and experience some amazing parts of Australia …….. bring it on!! Oh it is all so very exciting….and with that list to get through I am feeling nervous for you! What an adventure, what a lesson to teach the kids…..dream, plan, and make it happen! Wow….I have signed on as a loyal follower so keep us posted. Loved the blog design, looks great! We can’t wait Mum! And there will definitely be some Zac Brown playing when we hit the road! Your on an adventure of a lifetime, all four of you will learn a lot and come home with some amazing memory’s. I don’t feel very organised Michelle! Oh well – signing with a real estate agent tomorrow – so by June we will be out of a house so it will all just have to happen!! The blog looks great Jess! I can’t wait to read the posts as they come through, living out my dreams of hitting the wide open road. You’ll have an amazing journey, an education second to none for the kids and a shared experience that will be remembered forever. Looking forward to our last camping trip together before you go. Another along for the ride… living the dream through you guys!